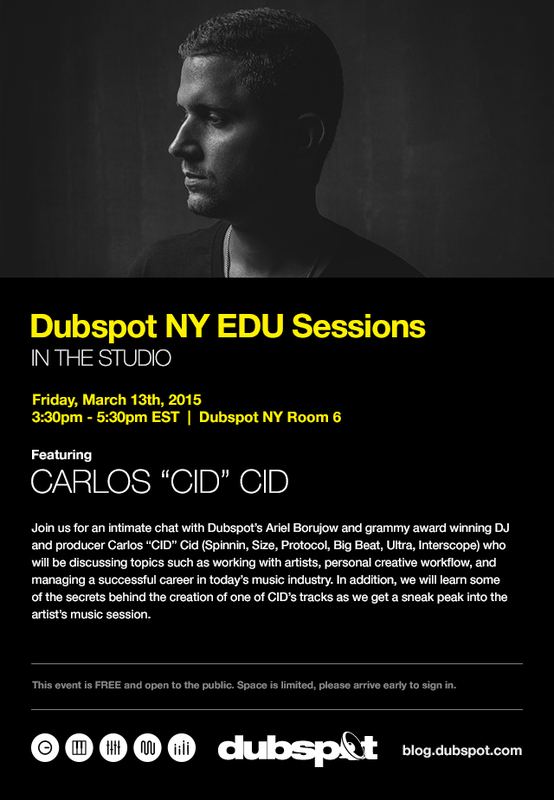 On March 13th, Dubspot’s Ariel Borujow hosts a special NY EDU Sessions workshop on managing a successful career in today’s music industry with Grammy award winning DJ/Producer Carlos “CID” Cid. Join us for an intimate chat with Grammy award winning DJ/Producer Carlos “CID” Cid (Spinnin, Size, Protocol, Big Beat, Ultra, Interscope) who will be discussing topics such as working with artists, personal creative workflow, and managing a successful career in today’s music industry. In addition, we will learn some of the secrets behind the creation of one of CID’s tracks as we get a sneak peak into the artist’s music session. This free workshop is hosted by Dubspot instructor and multi-platinum, Grammy-nominated mix engineer Ariel Borujow. CID was born and raised in Queens, New York. His dedicated passion for music started showing at the age of just 11 years old, when he would regularly travel for miles on the bus, so he could spend hours listening to new music at his favorite record shop. It wasn’t long before he became acquainted with some of New York’s finest DJs, as they became increasingly curious of this enthusiastic young kid, who was seamlessly browsing the same records that they’d been spinning at clubs the night before.His love for DJing became the catalyst for his natural progression into the world of music production.At this stage, it became evident that CID was not only just a talented & aspiring performing DJ, but that he was also developing great demand as an engineer & producer.His striking and infectious productions continue to capture the attention of many of the industries top personnel including Cedric Gervais, Sharam, Don Diablo, Spinnin Records, Protocol Recordings, Size X Records. and many more. It is an exciting stage in the career of CID, with an arsenal of explosive new material on the horizon, CID is set to take his burning ambition to the next level! Ariel Borujow is a multiple Grammy nominated, platinum mix engineer who began his career working at Sean “Puffy” Combs famed Daddy’s House Recording Studio in the late 90′s. Currently he is one of the most sought out mix engineers in NYC and has worked with everyone from Just Blaze, DJ Chuckie, Kanye West, T.I., Frequency, The Chainsmokers, Black Eyed Peas and many others. In 2011 he started a label with attorney/manager Joshua Kamen called ImprintOne80 (www.imprint180.com). Their focus is to bring back artist development that is missing in today’s musical climate. Furthermore, ImprintOne80 is committed to working closely with artists in achieving their goals without compromising quality. Ariel enjoys speaking publicly about his career and has joined panels for The Recording Academy, SXSW, Dynamic Producer, IStandard Producers, and did a 5 city Mixing Masterclass tour in Europe.. When he is not busy working on his label or speaking about his work, he is likely in the studio.